Background In 2015, the need for equitable access to cancer treatments in low- and middle income countries was underscored by the addition of 16 essential cancer medicines to the 19th World Health Organization (WHO) model list of essential medicines (WHO EML). This study assessed the degree to which this expanded WHO EML from 2015 has influenced inclusion of cancer medicines in the most recent national essential medicines lists of the countries of the WHO South-East Asia Region. Methods The inclusion of a selected list of 38 essential cancer medicines in the 2015 WHO EML was assessed in the most recent national lists of essential medicines from the 11 countries of the WHO South-East Asia Region. Additionally, the availability of six essential cancer medicines common to the national lists of essential medicines from six countries of the WHO South-East Asia Region was explored. Results Of the 38 selected essential cancer medicines included in the 19th WHO EML, a mean of 18.0 (range 2–33) were included in the national lists of countries of the WHO South-East Asia Region. Of the 25 essential cancer medicines included in the WHO EML prior to the 19th revision, a mean of 14.6 (range 2–21) were included in national lists; notably fewer of the 13 cancer medicines added in the 2015 revision were included: mean 3.4 (range 0–12). Conclusion Compared with the WHO EML, there is a lag in the inclusion of essential cancer medicines in national lists of essential medicines in the WHO South-East Asia Region. Alignment of essential cancer medicines in national lists of essential medicines among the 11 countries in the region varies significantly. These differences may hinder regional strategies to improve access to essential cancer medicines, such as pooled procurement of selected high-cost medicines. The link between the availability and affordability of essential cancer medicines warrants further investigation, in the context of access to medicines for universal health coverage. The four major noncommunicable diseases – cardiovascular diseases, cancers, chronic respiratory diseases and diabetes – are the leading causes of death both globally and in the World Health Organization (WHO) South-East Asia Region. The burden of noncommunicable diseases among individuals in the most economically productive age span is rapidly increasing because of population ageing and epidemiological transition. Compared with the global average and other WHO regions, the impact on the WHO South-East Asia Region is especially concerning, with the highest proportion of 30 year olds in 2015 projected to die before their 70th birthday from cardiovascular disease, cancer, chronic respiratory disease or diabetes (23.2%, global proportion = 18.8%). Moreover, loss of productive life-years more profoundly and disproportionately affects the poor, who lack access to affordable medicines and health care. The cancer burden in the WHO South-East Asia Region is high, with 1.1 million cancer-related deaths and 1.7 million new cancer cases in 2012. The annual number of new cancer cases globally is projected to increase from 14.1 million in 2012 to 21.6 million by 2030, yet barriers in access to safe, quality, effective and affordable options for prevention, detection and treatment continue, especially in low- and middle-income countries, where patients often present with advanced disease, further limiting treatment options and benefits. After a long absence from the global health agenda, the substantial and increasing burden of noncommunicable diseases was recognized by the United Nations in 2011, at the High-level Meeting of the General Assembly on the Prevention and Control of Non-communicable Diseases. The political declaration of the meeting acknowledged that “the global burden and threat of non-communicable diseases constitutes one of the major challenges for development in the twenty-first century, which undermines social and economic development throughout the world and threatens the achievement of internationally agreed development goals”. The resulting commitment by countries, including the Member States of the WHO South-East Asia Region, to raise awareness of and combat noncommunicable diseases, included promoting access to comprehensive and cost-effective prevention, treatment and care for the integrated management of noncommunicable diseases, with increased access to affordable, safe, effective and quality medicines. Following the political declaration, WHO Member States agreed the voluntary global targets of the Global action plan for the prevention and control of noncommunicable diseases 2013–2020, including a 25% relative reduction in the overall mortality from cardiovascular diseases, cancers, chronic respiratory diseases and diabetes. The availability of essential medicines for noncommunicable diseases in low- and middle-income countries is lower than that for communicable diseases. Furthermore, these medicines are less available in public facilities than in private facilities. Unaffordable medicines disproportionately impact poor and disadvantaged populations and impede a country’s social and economic development. In India alone, as many as 63 million people are forced into poverty every year, owing to catastrophic health expenses, the majority of which are out-of-pocket payments for medicines. The impoverishing impact of unaffordable out-of-pocket costs is a major barrier to the management of noncommunicable and chronic communicable diseases, especially when medicines need to be taken on a continued basis. There are also notable differences among the noncommunicable diseases; for example, essential medicines for cancer and diabetes are less affordable than treatments for hypertension. Access to medicines is just one component of equitable access to comprehensive cancer care, especially in low- and middle-income countries. Detection and treatment programmes require coordination of multiple disciplines, from pathology to radiation and surgery, at various levels of care. Molecular confirmation through immunohistochemistry may be required to select the appropriate, targeted treatment. Access to cancer care must therefore be strengthened across the care continuum. In addition, policies are needed to promote prevention through expanded vaccination coverage (i.e. human papillomavirus [HPV] vaccine to prevent cervical cancer and head and neck cancer); increase early detection through screening at primary care; and improve access to palliative care to ease suffering and pain. Universal health coverage and the Sustainable Development Goal for health can only be achieved in the WHO South-East Asia Region by 2030 if there is significant improvement in access to medicines and health care. The challenges to access are amplified in cancer care, spanning intensive engagement with prevention and detection at the primary care level, to specialized treatment, all of which require investment in health infrastructure and a qualified workforce. Improving access to cancer care must also link affordability and accessibility, by improvements such as strengthening public procurement and supply systems for essential cancer medicines. Essential medicines are intended to be available within the context of functioning health systems, at all times in adequate amounts, in the appropriate dosage forms, with assured quality and at a price the individual and the community can afford. Essential medicines satisfy the priority health-care needs of the population and are selected with due regard to cost effectiveness, although cost alone does not preclude selection. A list of essential medicines serves as a cost-effective planning tool for health systems, by including a limited set of products that best serve the population’s health needs and provide safe and effective treatments for the majority of communicable and noncommunicable diseases. The WHO model list of essential medicines (WHO EML) is not prescriptive. It is designed to guide governments in developing national lists of essential medicines. In practice, countries use the WHO EML as a starting point to evaluate the relevance of a medicine to their unique epidemiological situation (i.e. disease prevalence) and health system costs. Periodic review is required to add or remove items and ensure relevance according to the best available evidence for therapeutic options. The WHO model list of essential medicines is revised every 2 years, following the review of an expert committee, and, likewise, countries are recommended to regularly update their national list of essential medicines. In practice, a country’s national list of essential medicines may guide the procurement and supply of medicines in the public sector; medicine reimbursement schemes (such as health insurance); medicine donations; and local medicine production. Indeed, identification of a medicine as essential, by WHO and individual countries, has stimulated the entry of new manufacturers where there were shortages, underscored a medicine’s importance, and rallied stakeholder support to improve affordability and access, as was seen with antiretroviral medicines for HIV/AIDS. In 2014, at the invitation of WHO, the Union for International Cancer Control (UICC) convened experts to review Section 8.2 of the WHO EML, which recommends chemotherapeutic and hormonal agents for cancer treatment. This was the first full review of Section 8.2 in 15 years. The original WHO EML in 1977 included six cancer medicines, and new medicines were added after reviews in 1984, 1995 and 1999. Rather than augmenting the most recent list of 30 cytotoxic and adjuvant medicines for cancer already listed in the WHO EML, the experts convened by UICC developed a new approach, beginning with identification of cancer types that would most benefit from systemic treatment and/or cause the largest burden on the population. Thus, diseases were chosen that (i) are highly responsive to treatment but rare (chronic myeloid leukaemia); (ii) are highly responsive to treatment and common (breast cancer); and (iii) have a lower response to treatment but are highly burdensome (non-small-cell lung cancer). The 19th revision of the WHO EML in 2015 was therefore highly significant because it added 16 essential cancer drugs, including three high-cost medicines, imatinib, rituximab and trastuzumab, and therefore underscored the importance of improving equitable access to innovative treatments for cancer that are widely unavailable in low-resource settings. The long-term aspiration, likened to the 20-year progression of access to HIV/AIDS treatment, is to shape market forces and reduce the prices of essential cancer medicines so they are affordable and accessible, thereby expanding coverage. While there are obvious differences between the disease dynamics and options for prevention and treatment of cancer and HIV/AIDS, the point here is to focus on unifying shared strategies, like national lists of essential medicines, to improve equitable access to medicines. A recent analysis by Cuomo and Mackey found that the degree of concordance between national formularies of low- and middle-income countries and the 19th WHO EML regarding cancer medicines was less than 50%. In 2014, a study by Bazargani et al. included 8 of the 11 countries of the WHO South-East Asia Region and found a median of 23.5 (interquartile range [IQR] 26) essential oncology medicines included in the national lists of essential medicines at that time. In 2016, for counties of the WHO South-East Asia Region, Robertson et al. reported a median of 21 (range 2–24) of 25 cancer medicines from the 2013 WHO list and 1 (range 0–13) of 16 cancer medicines added in the 2015 WHO list revision. All countries in the region have revised their national formularies since these previous studies. Therefore, the present study aimed to report current country-level alignment of essential cancer medicines in the WHO South-East Asia Region with the 19th WHO EML. Of note, there is no standard methodology to compare alignment between national lists of essential medicines and WHO model lists. The level of alignment, in terms of cancer medicines, has rarely been studied, and the few prior studies focus on global comparisons, with subgroup analysis of WHO regions. To the authors’ knowledge, this is the first study to survey the selection of essential medicines for cancer in a group of countries within a WHO region. 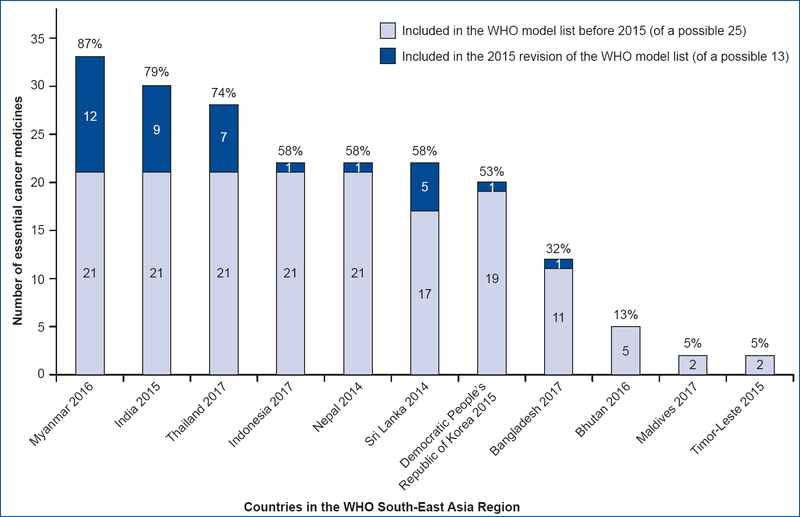 The composition of the WHO South-East Asia Region, with small and large pharmaceutical markets with a range of manufacturing capacities and supply-chain issues, offers a unique frame of comparison and consideration for access issues. The aim of presenting this country-level comparison of the WHO South-East Asia Region is to stimulate discussion on improving access to cancer medicines at country and subregional levels. As expressed by key coordinators of the 2015 WHO EML, “the challenge is to provide access to effective medicines without creating ad hoc vertical programmes and, at the same time, to avoid diverting funds from other important health-care services”. As such, as a first objective, this paper presents the inclusion of cancer medicines in national lists of essential medicines from the WHO South-East Asia Region. The second objective was to further explore the availability and affordability of selected cancer medicines in countries in the region, based on a recent survey by the European Society for Medical Oncology (ESMO) of the availability, out-of-pocket costs and accessibility of antineoplastic medicines outside of Europe. In an accompanying paper in this issue of the WHO South-East Asia Journal of Public Health, these findings are linked to a discussion on how to improve access, including – but not limited to – managing costs through regional cooperation; coordinated procurement mechanisms; price controls; differential pricing; and licensing agreements. The most recent national lists of essential medicines from the 11 countries of the WHO South-East Asia Region – Bangladesh (2016), Bhutan (2016), Democratic People’s Republic of Korea (2015), India (2015), Indonesia (2017), Maldives (2017), Myanmar (2016), Nepal (2016), Sri Lanka (2014), Thailand (2017) and Timor-Leste (2015) – were obtained via WHO country offices, WHO websites and internet searches. All national lists had been updated in the past 5 years, the majority following publication of the 19th WHO EML in 2015; therefore, the 2015 WHO EML was selected as a single reference of comparison across the 11 countries. In the 2015 WHO EML, Section 8 lists essential “Antineoplastics and immunosupressives”, and is divided into three sections: 8.1 Immunosupressive medicines; 8.2 Cytotoxic and adjuvant medicines; and 8.3 Hormones and antihormones. Because the definition of medicines used in cancer treatment can vary, and this study aimed to restrict analysis to a manageable set of essential cancer medicines that could be easily identified by a non-expert reviewing the WHO EML, it was decided, for this analysis, to operationally define “essential cancer medicines” as only those included in subsection 8.2. As a result, all essential cytotoxic and adjuvant cancer medicines from subsection 8.2 of the 19th WHO EML were selected – a total of 38 medicines. Of these, 13 of the 16 cancer medicines added in the 2015 revision were included; anastrazole, bicalutamide and leuprorelin were listed in Section 8.3, and thus excluded. Additionally, other examples of medicines in Section 8.3 included prior to 2015, such as tamoxifen for early-stage and metastatic breast cancer, and bicalutamide for metastatic prostate cancer, were excluded. The ESMO survey used an online survey tool adapted from prior collaborative studies, which was completed by at least two field reporters in each country, usually an oncologist or oncology pharmacist. Data were collected during 2015 and externally validated and corrected, as necessary, in the first half of 2016. The results on “actual availability with a valid prescription” were categorized as available “always”, “usually”, “half”, “occasionally”, or “never”, and those on “out-of-pocket cost” were categorized as “free”, “partial cost” or “full cost” (based on reimbursement for indication). Although an estimate of relative affordability was not detailed (i.e. comparison to per capita income, or number of days’ wages needed to purchase a course of treatment by the lowest-paid unskilled government worker), it may be assumed that a full-cost cancer medicine is not affordable to the majority of the population in a low- or middle-income country. The ESMO study included data from six countries from the WHO South-East Asia Region: Bangladesh, India, Indonesia, Myanmar, Nepal and Thailand. Of the cancer medicines surveyed by ESMO from national reimbursement lists, the six cancer medicines that were common to all six countries’ national lists of essential medicines were selected, to compare their availability and affordability. These were bleomycin, cyclophosphamide, doxorubicin, vinblastine and vincristine, which had been included in the WHO EML before 19th revision in 2015, and cisplatin. Cisplatin is an illustrative example of the dynamic nature of selected medicines based on available evidence, as it was first added to the WHO EML in 2000, removed and replaced by carboplatin in 2009, and then reintroduced in the 19th WHO EML in 2015, after both agents were recognized as required. Of the 38 selected essential cancer medicines included in the 19th WHO EML, a mean of 18.0 (range 2–33) were included in the national lists of countries in the WHO South-East Asia Region. Thus, the mean percentage alignment of national lists of essential medicines for the region to the 19th WHO EML was 47% (range 5–87%) (see [Figure 1]). Overall, most countries of the region included more than half of the selected essential cancer medicines. However, the alignment of the national lists of essential medicines in four countries was lower than half, with Bangladesh closer to one third, and the smallest countries by population, Bhutan, Maldives and Timor-Leste, even lower see [Figure 1]. [Figure 1] illustrates the inclusion of essential cancer medicines, by separating those included before 2015 from those added in the 2015 revision. However, countries may have already included specific medicines from those added in the 2015 revision in national lists of essential medicines revised prior to 2015. Of the 38 selected essential cancer medicines from the WHO EML, 13 were added in the 19th revision in 2015. National lists of essential medicines of countries of the WHO South-East Asia Region included a mean of 3.4 of these medicines (range 0–12) (dark shaded area in [Figure 1]). Of note, no medicines from this newer group were included in the three countries with the lowest alignment: Bhutan, Maldives and Timor-Leste. The four countries with the highest number of newer medicines were Myanmar, India, Thailand and Sri Lanka. Twenty-five of the 38 essential cancer medicines listed in the 2015 WHO EML were included prior to the 2015 revision (light shaded area in [Figure 1]). National lists of essential medicines of countries of the WHO South-East Asia Region included a mean of 14.6 of these medicines (range 2–21). The mean alignment for this group included prior to 2015 across the region was 59% (range 8–84%), markedly greater than the mean for the group of newer medicines added in the 2015 revision, of 26% (range 0–92%). No country had 100% alignment with this subgroup of 25 medicines. [Table 1] summarizes the 38 cancer medicines in ascending order, based on the number of countries of the WHO South-East Asia Region including the medicine in their most recent national lists of essential medicines. This table details the uptake of newer agents and high-cost medicines, including imatinib for chronic myeloid leukaemia in India, Myanmar and Thailand and trastuzumab for early-stage and metastatic breast cancer in India, Sri Lanka and Thailand. Overall, the newer agents cluster towards lower inclusion. The six selected cancer medicines – bleomycin, cyclophosphamide, doxorubicin, vinblastine and vincristine, plus cisplatin – were among those most often occurring in the national lists of the region’s countries; all were included in at least 8 of the 11 national lists of essential medicines. In the six countries assessed in the ESMO survey, overall, the six essential cancer medicines surveyed were always or usually accessible with a valid prescription (see [Table 2]). By contrast, the out-of-pocket costs ranged from free to full cost, suggesting unaffordability and financial risk for many patients. Of the six countries surveyed, Thailand and Indonesia enable access to affordable essential medicines through social health insurance programmes promoting universal health coverage. 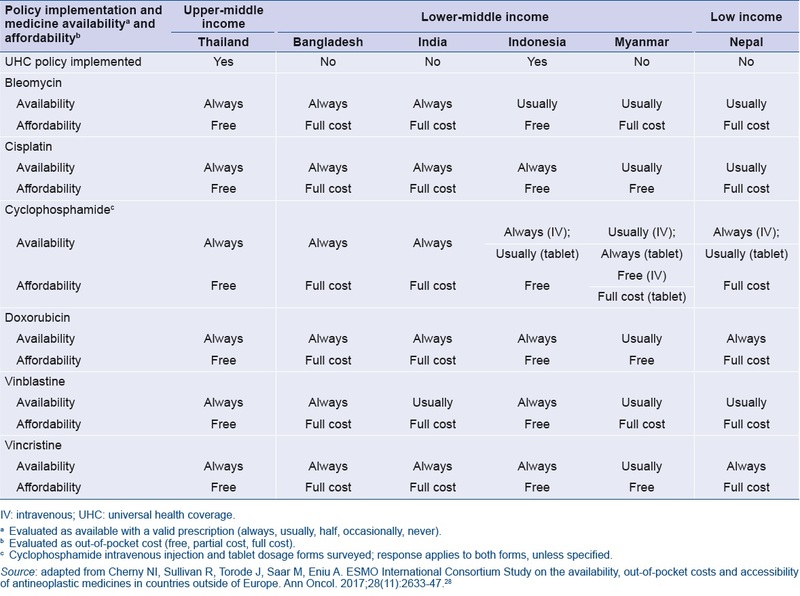 Not surprisingly, the pattern of always available and free (versus full cost), both enablers of access, was found in countries with social health insurance. Bangladesh, India, Myanmar and Nepal do not yet provide universal medicines coverage as a national policy. The study results suggest that in these countries the cancer drugs surveyed are only available at full cost. While there are limited free drug programmes (the scope of which was beyond this study), cancer medicines may not be included in these countries. There were no examples of limited availability (half, occasionally or never). However, in reality, shortages of free or price-controlled medicines is a known issue, especially in public sector pharmacies. Dominant barriers to access were also included in the ESMO survey and revealed the issues of no supplier or unreliable supply as those most frequently identified. 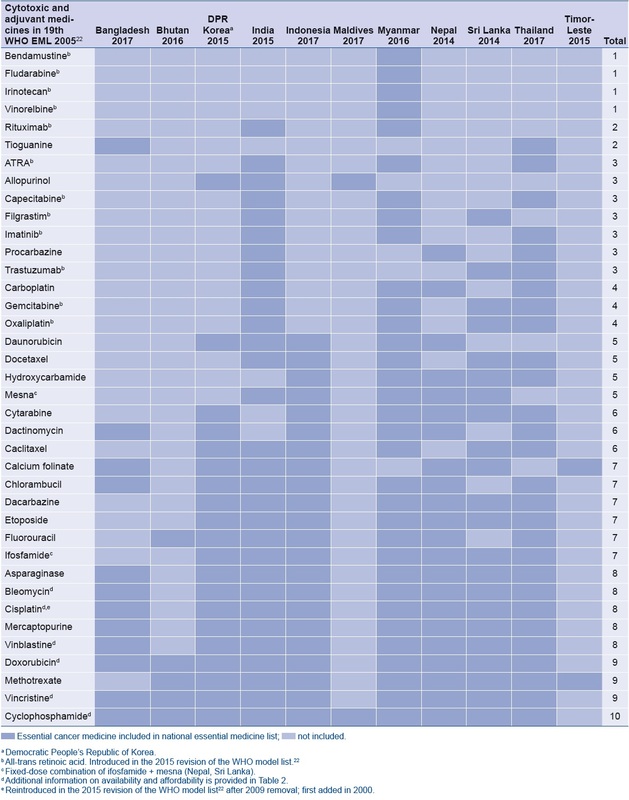 In this study, a mean of 18 of 38 (range 2–33) of the selected essential cancer medicines from the 19th WHO EML were included across the most recent national lists of essential medicines from the 11 countries of the WHO South-East Asia Region. Of the 25 medicines listed in the WHO EML prior to 2015, a mean of 14.6 (range 2–21) were included in national lists; and notably fewer of the 13 medicines were added in the 2015 revision (mean 3.4; range 0–12). Similar to Robertson et al., the results of the present study suggest a gap in alignment for cancer medicines added in 2015 to the 19th WHO EML. Further exploration is needed to understand why many of these cancer medicines included in older WHO model lists, prior to 2015, are still not included in many of the updated national lists of essential medicines in the region. Investigation into in-country challenges to accessing these cancer medicines from older WHO model lists should also be considered. Given the wide range of alignment across countries, comparisons should be interpreted with caution. The purpose of this study is to provide a crude regional overview of the inclusion of essential cancer medicines for the 11 countries of the WHO South-East Asia Region. The reasons for the relatively lower uptake of the newer essential cancer medicines warrant further exploration. The countries in the lowest quintile of alignment – Bhutan (13%), Maldives (5%) and Timor-Leste (5%) – are small countries with challenging geographies that lack the capacity for local pharmaceutical production. They may also use alternative strategies, such as sending patients with cancer for treatment abroad. Overall, the results of this study show a similar pattern to the limited previous research suggesting no significant shift in recent years in increasing the inclusion of essential cancer medicines for both older and newer targeted therapies in national lists of essential medicines. This is despite some national lists in this study being dated post 2015. In this descriptive analysis, comparing the alignment of cancer medicines included in the national lists of essential medicines to the 19th WHO EML rests on certain assumptions. First, it is assumed that the selection of essential cancer medicines in national lists of essential medicines is indicative of the respective governments’ commitment to ensuring equitable access to treatment and reducing the burden of disease. However, it is possible that some prioritized cancer medicines are available, despite not being included in national lists, because they are provided in other ways, such as through donations; specialized hospital lists; on a named patient basis, as commonly used in Bhutan; or other reimbursement models. Second, it is assumed that the 19th WHO EML is a meaningful standard of comparison, based on the noteworthy addition of cancer medicines. The year of revision should therefore be noted when interpreting the relative alignment of individual country lists. Clearly, not all countries from the WHO South-East Asia Region, have, to date, revised their national lists of essential medicine since April 2015, when the 19th WHO EML was published. Notably, the lists for Nepal and Sri Lanka are from 2014. Also, for the lists revised in 2015 from the Democratic People’s Republic of Korea, India and Timor-Leste, it is difficult to know whether there was enough time for national committees to incorporate the 19th WHO EML revisions of April 2015. We assume countries need time to assemble experts and evaluate the magnitude of clinical benefit and the risk–benefit profile of medicines – the main criteria for inclusion of cancer medicines, especially considering the financial implications to health systems of including these high-cost medicines. Interestingly, Sri Lanka’s national list of essential medicines was revised for 2013–2014, showing that the five newer medicines were included prior to the 19th WHO EML in 2015. In a review in 2013 of national lists of selected low- and middle-income countries, inclusion of new-generation cancer medicines not yet included in the WHO EML was also observed for India and Indonesia. This lag may reflect in part that the WHO model list had not been updated to keep up with changes in treatment protocols over time. Previous studies have focused on global comparisons between regions, whereas this analysis focuses on comparing selected essential cancer medicines within a WHO region. In order to ease the comparison of selected medicines across the 11 countries of the WHO South-East Asia Region, the 2015 WHO EML was used as a single reference of comparison, and the analysis was restricted to the 38 essential medicines from Section 8.2 Cytotoxic and adjuvant medicines. As a result, comparisons for certain widely used essential cancer medicines, such as tamoxifen for breast cancer, are not presented here. Strategies and policies to promote universal health coverage are central to improving the affordability of essential cancer medicines. From the ESMO survey study by Cherny et al. 2017, it is observed that cancer medicines may be available in the countries of the WHO South-East Asia Region, but not affordable. Full out-of-pocket costs appear to be borne by patients in Bangladesh, India and Nepal, putting these patients and their families at risk of catastrophic expenses that push households into poverty. In Indonesia and Thailand, countries with policies for universal health coverage, the studied medicines are available free of cost, offering financial protection to cancer patients in these countries. Myanmar offers an intermediate example of where some cancer medicines are free, while others are available at full cost. The 2015 revision of the 19th WHO EML to include essential hepatitis C, drug-resistant tuberculosis and cancer medicines was announced as an important, and perhaps overdue, recognition of the need “to improve access to innovative medicines that show clear clinical benefits and could have enormous public health impact globally”. However, there is an apparent lag between the 2015 revision of the WHO EML and the inclusion of essential cancer medicines in national lists of essential medicines in the WHO South-East Asia Region. Also, there is variance in the overall alignment of essential cancer medicines in national lists of essential medicines among the 11 countries in the region. These differences in alignment may hinder regional strategies to improve access to essential cancer medicines, such as pooled procurement of selected high-cost medicines. The link between availability and affordability of essential cancer medicines warrants further investigation, in the context of access to medicines for universal health coverage. Source of support: The work contributing to this paper was supported by the World Health Organization Regional Office for South-East Asia, New Delhi, India. Authorship: MVC completed the data analysis and developed the manuscript. KT designed the study and reviewed the manuscript. Global status report on noncommunicable diseases 2014. Geneva: World Health Organization; 2014 (http://apps.who.int/iris/bitstream/handle/10665/148114/9789241564854_eng.pdf?sequence=1, accessed 4 June 2018). World Health Organization. Global Health Observatory data repository. Risk of premature death from the four target NCDs indicator. Data by WHO region (http://apps.who.int/gho/data/view.main.2485REG, accessed 4 June 2018). World Health Organization. International Agency for Research on Cancer. GLOBOCAN 2012: estimated cancer incidence, mortality and prevalence worldwide in 2012. WHO South-East Asia Region (SEARO) (http://globocan.iarc.fr/Pages/fact_sheets_population.aspx?country=995, accessed 4 June 2018). Cancer prevention and control in the context of an integrated approach. Report by the Secretariat. Seventieth World Health Assembly, Geneva, 13 April 2017. Geneva: World Health Organization; 2017 (A70/32; http://apps.who.int/gb/ebwha/pdf_files/WHA70/A70_32-en.pdf, accessed 7 June 2018). Resolution 66/2. Political Declaration of the High-level Meeting of the General Assembly on the Prevention and Control of Non-communicable Diseases. In: Sixty-sixth session of the United Nations General Assembly, 2011–2012. New York: United Nations; 2012 (A/RES/66/2; http://www.who.int/nmh/events/un_ncd_summit2011/political_declaration_en.pdf, accessed 4 June 2018). Global action plan for the prevention and control of noncommunicable diseases 2013–2020. Geneva: World Health Organization; 2013 (http://apps.who.int/iris/bitstream/handle/10665/94384/9789241506236_eng.pdf;jsessionid=9BFBBAD2E0715AE702AB068D4113521E? sequence=1, accessed 4 June 2018). Hogerzeil HV, Liberman J, Wirtz VJ, Kishore SP, Selvaraj S, Kiddell-Monroe R et al. ; Lancet NCD Action Group. Promotion of access to essential medicines for non-communicable diseases: practical implications of the UN political declaration. Lancet. 2013;381(9867):680–9. doi:10.1016/S0140-6736(12)62128-X. Cameron A, Roubos I, Ewen M, Mantel-Teeuwisse AK, Leufkens HG, Laing RO. Differences in the availability of medicines for chronic and acute conditions in the public and private sectors of developing countries. Bull World Health Organ. 2011;89(6):412–21. doi:10.2471/BLT.10.084327. Berman P, Ahuja R, Bhandari L. The impoverishing effect of healthcare payments in India: new methodology and findings. Econ Polit Wkly. 2010;45:65–71 (http://www.epw.in/journal/2010/16/special-articles/impoverishing-effect-healthcare-payments-india-new-methodology-and, accessed 4 June 2018). Niëns LM, Cameron A, Van de Poel E, Ewen M, Brouwer WB, Laing R. Quantifying the impoverishing effects of purchasing medicines: a cross-country comparison of the affordability of medicines in the developing world. PLoS Med. 2010;7(8):e1000333. doi:10.1371/journal.pmed.1000333. Cancer medicine prices in low- and middle-income countries. Boston (MA): Global Task Force on Expanded Access to Cancer Care and Control in Developing Countries; 2011 (http://apps.who.int/medicinedocs/documents/s21671en/s21671en.pdf, accessed 4 June 2018). Shulman LN, Wagner CM, Barr R, Lopes G, Longo G, Robertson J et al. Proposing essential medicines to treat cancer: methodologies, processes, and outcomes. J Clin Oncol. 2016;34(1):69–75. doi:10.1200/JCO.2015.61.8736. Farmer P, Frenk J, Knaul FM, Shulman LN, Alleyne G, Armstrong L et al. Expansion of cancer care and control in countries of low and middle income: a call to action. Lancet. 2010;376(9747):1186–93. doi:10.1016/S0140-6736(10)61152-X. Sustainable Development Knowledge Platform. Sustainable Development Goal 3. Ensure healthy lives and promote well-being for all at all ages (https://sustainabledevelopment.un.org/sdg3, accessed 4 June 2018). Wirtz VJ, Hogerzeil HV, Gray AL, Bigdeli M, de Joncheere CP, Ewen MA et al. Essential medicines for universal health coverage. Lancet. 2017;389(10067):403–76. doi:10.1016/S0140-6736(16)31599-9. Essential medicines and health products. Essential medicines. Report by the Secretariat. In: One hundred and ninth session of the Executive Board, Geneva, 14–21 January 2001. Geneva: World Health Organization; 2001 (http://www.who.int/medicines/services/essmedicines_def/en/, accessed 4 June 2018). WHO medicines strategy: revised procedure for updating WHO’s Model List of Essential Drugs. Geneva: World Health Organization; 2001 (ERB109/8; http://apps.who.int/gb/archive/pdf_files/EB109/eeb1098.pdf?ua=1, accessed 4 June 2018). WHO model list of essential medicines, 20th list (March 2017) (Amended August 2017). Geneva: World Health Organization; 2017 (http://www.who.int/medicines/publications/essentialmedicines/20th_EML2017_FINAL_amendedAug2017.pdf?ua=1, accessed 4 June 2018). Essential medicines selection. Item II: how to develop a national essential medicines list. Agenda item for the eighteenth Expert Committee on the Selection and Use of Essential Medicines. Geneva: World Health Organization; 2011 (http://www.who.int/selection_medicines/committees/expert/18/policy/policy2/en/, accessed 4 June 2018). Magrini N, Robertson J, Forte G, Cappello B, Moja LP, de Joncheere K et al. Tough decisions on essential medicines in 2015. Bull World Health Organ. 2015;93(4):283–4. doi:10.2471/BLT.15.154385. Statement by the Union for International Cancer Control (UICC). Twentieth WHO Expert Committee on the Selection and Use of Essential Medicines. Geneva: World Health Organization; 2015 (http://www.who.int/selection_medicines/committees/expert/20/reviews/open-session_UICC-statement_18-apr-15.pdf?ua=1, accessed 4 June 2018). WHO model list of essential medicines, 19th list (April 2015) (Amended November 2015). Geneva: World Health Organization; 2015 (http://www.who.int/medicines/publications/essentialmedicines/EML_2015_FINAL_amended_NOV2015.pdf?ua=1, accessed 4 June 2018). Eniu A, Torode J, Magrini N, Bricalli G; Union for International Cancer Control EML Steering Committee Members. Back to the ‘essence’ of medical treatment in oncology: the 2015 WHO Model List of Essential Medicines ESMO Open 2016;1:e000030. doi:10.1136/esmoopen-2015-000030. Hoen E, Berger J, Calmy A, Moon S. Driving a decade of change: HIV/AIDS, patents and access to medicines for all. J Int AIDS Soc. 2011;14(1):15. doi:10.1186/1758-2652-14-15. Cuomo RE, Mackey TK. The availability of essential cancer medication: an analysis of national formularies. J Cancer Policy. 2017;12:49–54. doi:10.1016/j.jcpo.2017.03.010. Bazargani YT, de Boer A, Schellens JH, Leufkens HG, Mantel-Teeuwisse AK. Selection of oncology medicines in low- and middle-income countries. Ann Oncol. 2014;25(1):270–6. doi:10.1093/annonc/mdt514. Robertson J, Barr R, Shulman LN, Forte GB, Magrini N. Essential medicines for cancer: WHO recommendations and national priorities. Bull World Health Organ. 2016;94(10):735–42. doi:10.2471/BLT.15.163998. Cherny NI, Sullivan R, Torode J, Saar M, Eniu A. ESMO International Consortium Study on the availability, out-of-pocket costs and accessibility of antineoplastic medicines in countries outside of Europe. Ann Oncol. 2017;28(11):2633-47. doi:10.1093/annonc/mdx521. Chivukula MV, Tisocki K. Approaches to improving access to essential cancer medicines in the WHO South-East Asia Region. WHO South-East Asia J Public Health. 2018;7(2):62–6. doi:10.4103/2224-3151.xxxxxx. Essential drug list – 2016. Dhaka: Directorate General of Drug Administration, Ministry of Health & Family Welfare, Government of the People’s Republic of Bangladesh; 2017 (http://www.dgda.gov.bd/index.php/2013-03-31-05-16-29/guidance-documents/219-essential-drug-list-2016, accessed 4 June 2018). National essential medicines list 2016. Thimphu: Ministry of Health, Royal Government of Bhutan; 2016 (http://www.health.gov.bt/wp-content/uploads/moh-files/2016/08/National-Essential-Medicines-List-2016.pdf, accessed 4 June 2018). National list of essential medicines – 2015. Pyongyang: Ministry of Public Health, Democratic People’s Republic of Korea; 2015. National list of essential medicines 2015. New Delhi: Ministry of Health and Family Welfare Government of India; 2015 (http://apps.who.int/medicinedocs/documents/s23088en/s23088en.pdf, accessed 4 June 2018). National list of essential medicines 2017. Jakarta: Ministry of Health, Republic of Indonesia; 2017. Approved Drug List. Male’: Maldives Food and Drug Authority; 5 July 2017 (http://www.health.gov.mv/Uploads/Downloads//Informations/Informations(74).pdf, accessed 11 June 2018). National list of essential medicines (NLEM) 2016. Nay Pyi Daw: The Republic of the Union of Myanmar, Ministry of Health and Sports, Department of Medical Services; 2016 (http://mohs.gov.mm/Main/content/publication/essential-medicine-national-list-of-essential-medicines-2016, accessed 4 June 2018). National list of essential medicines Nepal (fifth revision) 2016. Kathmandu: Government of Nepal, Ministry of Health, Department of Drug Administration; 2016 https://nepal.gov.np/alfresco/d/d/workspace/SpacesStore/464222c7-4bf2-4100-af69-df6fd259837f/FinalNLEM.pdf, accessed 4 June 2018). National list of essential medicines Sri Lanka 2013–2014. Fifth revision. Colombo: Ministry of Health, Government of the Democratic Socialist Republic of Sri Lanka; 2014 (http://nmra.gov.lk/images/pdf/final-book.pdf, accessed 4 June 2018). National list of essential medicines – 2017. Bangkok: Food and Drug Administration Thailand; 2017 (http://www.ratchakitcha.soc.go.th/DATA/PDF/2560/E/119/27.PDF, accessed 4 June 2018). Timor Leste essential medicines list, 3rd ed. Dili: Committee for Selection of Medicines, Products and Medical Equipment, Ministry of Health, Democratic Republic of Timor-Leste; 2015 (http://apps.who.int/medicinedocs/documents/s23297en/s23297en.pdf, accessed 4 June 2018). World Health Organization. Comparative table of medicines on the WHO essential medicines lists from 1977–2011 (http://www.who.int/medicines/publications/essentialmedicines/EMLsChanges1977_2011.xls?ua=1, accessed 4 June 2018). Medicines in health care delivery, Bhutan. Situational analysis: 20 July – 31 July 2015 (http://www.searo.who.int/entity/medicines/bhutan_situational_analysis_oct15.pdf?ua=1, accessed 4 June 2018). Understanding the role and use of essential medicines lists. Parsippany (NJ): IMS Institute for Healthcare Informatics; 2015 (http://apps.who.int/medicinedocs/documents/s21980en/s21980en.pdf, accessed 4 June 2018). World Health Organization Media Centre. WHO moves to improve access to lifesaving medicines for hepatitis C, drug-resistant TB and cancers. News release, 8 May 2015. (http://www.who.int/mediacentre/news/releases/2015/new-essential-medicines-list/en/, accessed 4 June 2018).